Students enroll in a teacher’s classroom. Nine months later, they take a test. How much did the first event, the teaching, cause the second event, the test scores? ..... Thirty-five years ago, a statistician, William S. Sanders, offered an answer to that puzzle....Teachers whose students’ scores consistently grew more than expected were achieving unusually high levels of “value-added.” Those, Mr. Sanders declared, were the best teachers. Up until his death, Mr. Sanders never tired of pointing out that none of the critiques refuted the central insight of the value-added bell curve: Some teachers are much better than others, for reasons that conventional measures can’t explain. His system is still used in Tennessee today. In the last dozen years or so, the state’s scores on federal N.A.E.P. exams have improved faster than those of the average state. 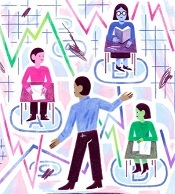 While the use of value-added ratings to hire, fire and pay teachers may have been limited by political pressure, the importance of the value-added bell curve itself continues to grow — less like a sudden explosion than a chime whose resonance gains in power over time. The questions that occupy lawmakers and administrators today are not whether to identify the most and least effective teachers, but how.